If my backyard could talk, it would shout “Oh boy oh boy!” You may ask “why?” Basically because it is all set up for boys to have adventures. With trees for climbing, bushes for hiding and lawn for running, the backyard is fully equipped. But even I wanted to add some more features to this playful paradise. 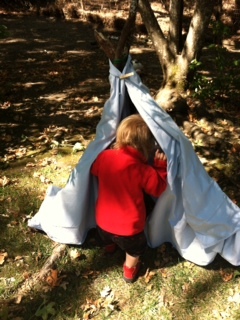 So, some days the boys and I will build impromptu teepees, fairy villages and volcanoes. But the other day, my husband had an idea. He built something totally fabulous for the boys. 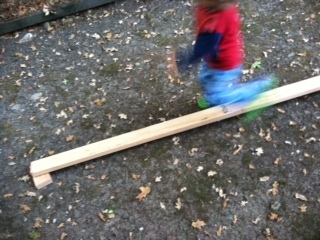 With three pieces of wood and a few nails, our backyard now boasts a balance beam! This new feature is simply fabulous in every way. It’s good for about ten minutes of active play, but heck, the boys have so much fun stepping on it, off of it and trying to balance. Who knew three pieces of wood would prove to be so useful! 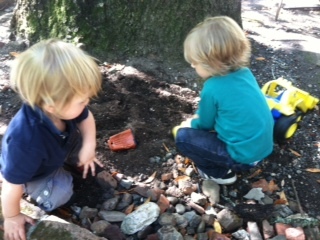 What are your favorite ways for sprucing up the backyard for kid play? I’d love to hear! This entry was posted in activities, Uncategorized and tagged Backyard, Gardens, Home, Home and Garden, Patio, Recreation on October 11, 2013 by Modern Mama. This entry was posted in activities, crafts on September 19, 2013 by Modern Mama. With the summer heat comes extra time to spend outside, of course incorporating water as much as possible. 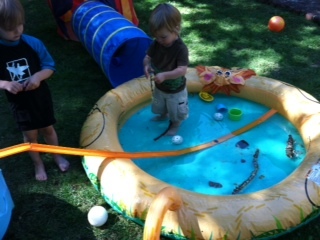 But there is only so long that a baby pool, water table and sprinklers will capture the attention of my boys. So, I’ve been coming up with some fun games to prolong the fun. We’ve done all sorts of things from building ramps between the water table and pool to practicing to fish. But one game has stood the test of time around here. We call it sink or float. Wanna play? Here’s how. 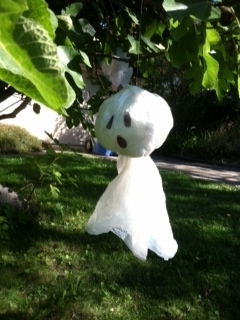 First, we went on a hunt for objects around the yard. CJ pulled a little red wagon which not only kept him engaged but also proved to be most helpful. 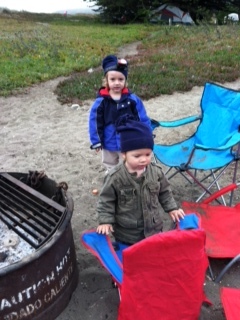 Then both boys picked up various objects like rocks, leaves, moss – oh and their favorite — sticks. Once all items were collected, we went to go test out to discover which ones would sink or float. Before putting an item in the water, Bobby would guess whether it would sink or float. Then he or CJ would toss it in (or slide it down the ramp). To build a ramp, just get some handy dandy hotwheels track. You should have heard the cheers when Bobby’s guess was right. Not only does this simple game provide loads of fun, but it also is an easy way to start talking about buoyancy . Now, my boys are trained so that when they see the baby pool they start searching for materials to test out in it. 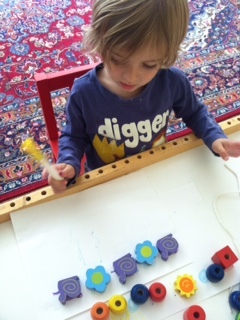 This entry was posted in activities and tagged Business, Environment, Home and Garden, Water, Water Resources, Water table on August 27, 2013 by Modern Mama.